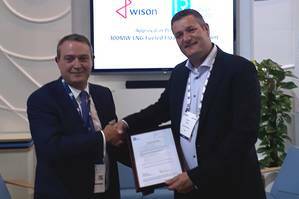 Lloyd's Register (LR) has issued approval in principle (AiP) to Wison for its 300MW capacity floating storage, regasification, power plant (FSRP) concept design. A relatively new design concept, FSRPs are essentially floating liquefied natural gas (LNG) power plants that receive LNG from ships and store it within tanks below deck, before regasifying the LNG and using it to fuel an onboard power plant. LR, Wison and Gaztransport & Technigaz (GTT) are working together in developing this 300MW barge-type FSRP unit that will be moored at a jetty or placed near-shore. It will be designed, constructed and built to supply 300MW electrical power, using LNG as fuel. GTT is an engineering company designing cryogenic membrane containment systems dedicated to the transport and storage of liquefied gases, and in particular LNG. Maarten Spilker, Wison Solutions Director, said, "Our integrated LNG-to-power solution is a response to market demand for affordable power sources with a short development schedule. Using proven technology as building blocks, we put together a robust design." A Joint Development Project (JDP) agreement between LR, Wison and GTT has also been signed this week. This includes the undertaking of further work for example, more detailed design reviews, support for the preparation of Wison to build GTT membrane type LNG tanks as well as possible additional items like risk assessments. "Together with Lloyd's Register, GTT and other key technology suppliers we will continue to mature and refine our product," Spilker said. "High efficiency LNG-fueled floating power plants offer a unique set of advantages over other power solutions. We will be ready to deliver."